Finally a proper Chicken Monday on the correct day! Lately we have been having quick cooked sides because it has been hot but Monday it was cool all day. Time to break out the root vegetables! 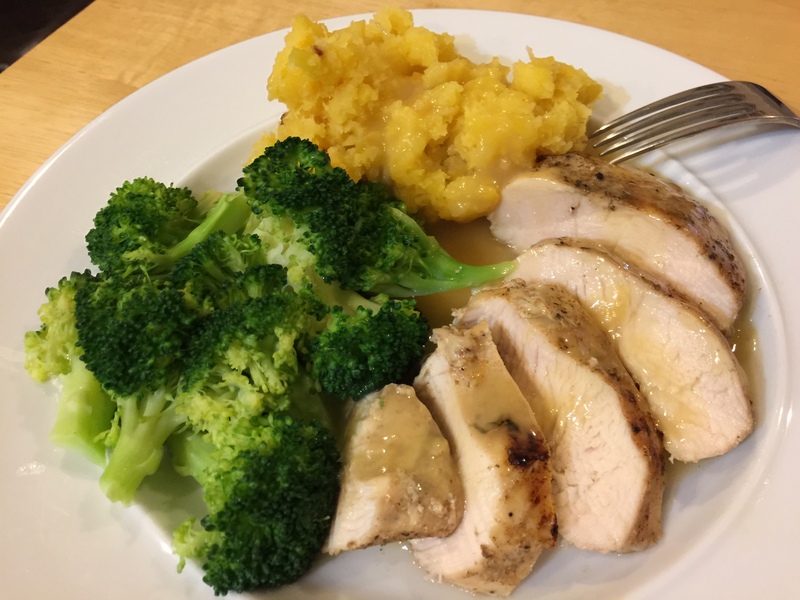 John manned the immersion circulator and then finished the chicken breasts under the broiler for a little color. He also made up the packet of gravy. Rather than haul out the pressure cooker, I microwaved the rutabagas for around 20 minutes after peeling and chopping them up into fairly small chunks. Really, the peeling, which I do with my chef’s knife, is the most time consuming part of preparing the rutabagas. The broccoli was simply steamed. Both the broccoli and the rutabagas got a pat of butter. Much like the meatloaf meal the other day, this is also comfort food to me. This entry was posted in Poultry, Vegetables and tagged broccoli, chicken, rutabagas. Bookmark the permalink. looks so comforting and delicious.